NIH’s recent focus on data-intensive and data-driven biomedical research makes this an exciting time for me to be joining NIGMS and leading its Division of Biomedical Technology, Bioinformatics, and Computational Biology (BBCB). New steps toward harnessing the power of data began well before my arrival and include the NIH Big Data to Knowledge (BD2K) initiative. The overarching aim of this initiative is to enable, by the end of this decade, a “quantum leap” in the ability of the biomedical and behavioral research enterprise to use the growing volume of complex data to produce important insights into biological systems. This is an ambitious goal that requires the collective engagement and expertise of NIH’s many institutes, centers, and offices, including NIGMS, as well as the scientific community. My colleagues from across NIH have already come together to discuss future solutions that will benefit NIH and the research community as a whole. We recognize that no one-size-fits-all solution will emerge as the “data quantum leap.” Our hope is that by engaging academic, industrial and other biomedical stakeholders, we will impact the volume, variety, velocity, viability and ultimately value of the data that NIH invests in. To jumpstart this activity, NIH recently issued a new funding opportunity announcement (FOA) for Centers of Excellence for Big Data Computing in the Biomedical Sciences. The purpose is to establish an interactive consortium of centers that will develop approaches, methods and software tools for the aggregation, integration, analysis and visualization of data across NIH-funded research areas. NIH also has issued a request for information on the development of analysis methods and software for big data; responses are due by September 6. NIGMS and the BBCB staff were actively involved in crafting the new FOA and, more generally, have played a central role in the creation and organization of the BD2K initiative. We will continue to be active partners in this endeavor. Big data is just one example of the division’s efforts. We foster research in a range of fields, including computational biology, bioinformatics, mathematical and statistical biology, and biomedical technology development. We also support programs that train people in many of these areas. I’m so happy to be involved in shaping the division’s activities, and I look forward to working together with many of you to continue innovating basic biomedical research. I’m the director of the newly created NIH Office of Emergency Care Research (OECR), which is housed in NIGMS. For the past 11 years, I was an emergency medicine physician and clinical researcher. So you might be wondering why I’m writing a post for a blog primarily read by thousands of basic scientists. Don’t stop reading, though, because OECR and NIGMS-funded research have more in common than you might think. Let’s take a quick look at one area where basic and emergency medicine research interests converge—sepsis. NIGMS supports both fundamental studies and clinical research on sepsis, including the PRoCESS (Protocolized Care for Early Septic Shock) clinical trial. This study is designed to determine if early intervention with rigorous, standardized care in sepsis and septic shock can improve clinical outcomes. It’s an astonishingly important effort to address a disease that often presents to the emergency department and that has a mortality rate of about 30 percent. Should the study demonstrate improved outcomes, it will change the care of some 750,000 Americans who develop sepsis each year. In addition to sepsis, NIGMS funds research in other areas relevant to emergency medicine, including trauma, burn injury, wound healing, and anesthesia. To promote the training of the next generation of emergency care researchers. It’s a big mission for a small office, but we are fortunate to have many energetic partners across NIGMS, NIH and the broader community. Whether you’re a basic scientist or a clinician, the ultimate goals are the same, so I welcome your interest in and input on OECR activities. NIH has posted additional scoring guidance for reviewers to consider when determining overall impact scores for grant applications. Here are answers to some key questions about this new guidance. Scientific review officers and program directors noticed that reviewers have tended to arrive at overall impact scores by comparing the number of weaknesses and strengths in an application, rather than balancing the importance of the weaknesses and strengths. In addition, there was significant compression of overall impact scores around the perceived funding range. Both practices made it more difficult to gauge reviewer assessments. The additional guidance chart simplifies and clarifies the way in which reviewers should evaluate the overall impact of an application. In particular, it encourages reviewers to focus on the importance of the research problem and the likelihood that the project will succeed. The chart emphasizes a balanced assessment of the review criteria and the use of the entire scoring range. The general Scoring System and Procedure also includes a new, simplified scoring guidance chart for assigning individual criterion scores. Some Center for Scientific Review (CSR) study sections used the new guidelines in application reviews for May 2013 advisory council meetings. So that these applications would not be disadvantaged by the deviation from the impact score distribution of previous review cycles used for percentiling, CSR recalculated the percentile base. The vast majority of study sections and special emphasis panels are using the new scoring guidance with the reviews for fall 2013 advisory council meetings. Note: New scoring guidelines are also available for fellowships, career awards and institutional training grants. Having been a fan of Jeremy Berg’s Feedback Loop posts, it’s a great pleasure to be writing one myself. I am very excited to be at NIGMS, and I am honored to have the chance to lead this extraordinary institute. Over the past year, whenever I asked anyone familiar with NIGMS what the best thing about it was, they all said the same thing: the people who work there. My own observations have been completely consistent with these assessments. The staff at NIGMS is an exceptional group, deeply committed to ensuring that the biomedical and behavioral research enterprise thrives. No one embodies this commitment better than Judith Greenberg, who has done an outstanding job over the past 2 years steering the Institute through challenging times. I hope you will join me in thanking her for everything she has done. A key part of Jeremy’s legacy at NIGMS was increasing communication between the Institute and the scientific community. I intend to stay on this course, using the Feedback Loop as well as other mechanisms to catalyze discussions. I encourage you to join in these conversations and to suggest specific questions that you’d like to see us address. I also intend to push forward the data collection and analysis efforts begun by Jeremy, both to help inform our discussions with the scientific community and to guide our policy decisions. Among my first orders of business are to conduct a thorough analysis of NIGMS’ grant portfolio and to begin developing a new strategic plan for the Institute. The overall goal of these synergistic undertakings is to ensure that we are investing the taxpayers’ money in the most efficient and effective way possible. Science and society both evolve rapidly, and the structures and strategies that worked well in the past are not necessarily optimal for the future. We will be thinking broadly, using data to inform our analyses, and we will be seeking your ideas and innovations. This would also be a good time for the scientific community to engage in a parallel process of introspection, examining topics ranging from how the research enterprise is organized to how the impact of scientists’ work is assessed and recognized through peer review and other mechanisms. The process could happen both at a local level—within your own institutions—and at a national one, perhaps led by the relevant scientific and academic societies. I will always be happy to hear your thoughts and suggestions, either through this blog or directly at jon.lorsch@nih.gov. I am looking forward to working with you! 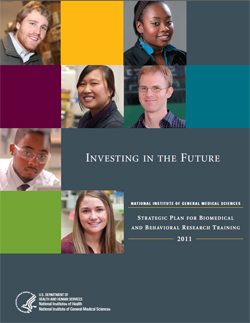 Many of the themes in our strategic plan for research training have been echoed by the Biomedical Workforce Working Group of the Advisory Committee to the Director, NIH. Among these is the use of individual development plans (IDPs) to facilitate career development discussions and planning between mentees and mentors. I’m delighted to share some progress on this front. Describe the use of those IDPs in the Research Performance Progress Report for projects reporting student and/or postdoc researchers. For more details, read this blog post from NIH’s Sally Rockey. The Blueprint for Implementation of our training strategic plan provides links to resources for developing IDPs, including AAAS’s myIDP Web site. Another source of useful tips is a presentation on “Facilitating Career Development through Individual Development Plans” given by Philip Clifford of the Medical College of Wisconsin at our recent Training, Workforce Development, and Diversity Program Directors’ meeting. IDPs are a valuable tool to help graduate students and postdocs identify their career goals and what they need to accomplish to achieve those goals. They are one part of the changing conversations about preparing trainees for the broader landscape of exciting biomedical careers.